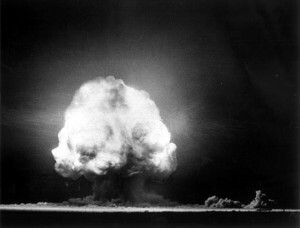 In 1956, seventeen nuclear and thermonuclear bombs were detonated in the South Pacific, each code-named after a different indigenous tribe or group in the U.S. These bombs were designed, manufactured, and named within the Los Alamos National Laboratory (LANL) in northern New Mexico. This is just one example of appropriation from a long history of LANL and the U.S. government mistreating Pueblo communities. In the 1940s, the U.S. government asked the San Ildefonso Pueblo to give up part of their land for military purposes; the San Ildefonso Pueblo relinquished the land with the understanding that it would be returned after World War II. 1n 1943, this sought-after patch of land became the site of LANL, where most of the research for the top-secret Manhattan Project would take place.2 For the next fifty years, the various Pueblo peoples living near to and downriver from LANL would have essentially no knowledge or voice concerning the dangerous materials that LANL was leaking and dumping into the air, water, and land. 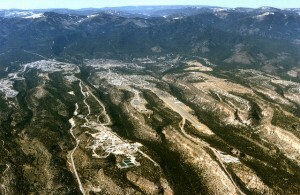 Through destruction of sacred sites, bomb tests, nuclear waste disposal, and poor environmental ethics, Los Alamos has been a pervasive source of environmental injustices for the original caretakers and inhabitants of the land: the numerous Pueblo communities of Northern New Mexico. In order to confront the environmental injustices that have occurred to the numerous indigenous communities near the Los Alamos National Laboratory, it is crucial to reflect on the cultures and histories of these peoples. Their relationships with the land, water, and air that have now been polluted and made toxic, are both ancient and constant. LANL has irreversibly changed the landscape of New Mexico and has exposed unknowing towns and cities to dangerous amounts of radiation. 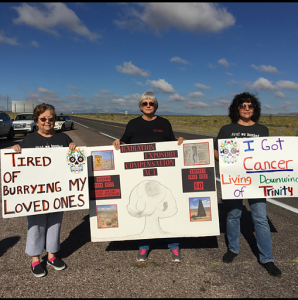 LANL’s treatment of the adjacent landscapes and communities constitutes an environmental injustice because they failed to educate the public and to contain all of their nuclear wastes, leading to numerous health issues for many living nearby. 1Masco, Joseph. The Nuclear Borderlands. Princeton, N.J.: Princeton University Press, 2006. Print. 3Kosek, Jake. Understories. Durham: Duke University Press, 2006. Print. 4Fresquez, P. R. et al. “The Uptake Of Radionuclides By Beans, Squash, And Corn Growing In Contaminated Alluvial Soils At Los Alamos National Laboratory”. Journal of Environmental Science and Health, Part B 33.1 (1998): 99-121. Web. This entry was posted in Uncategorized and tagged Los Alamos National Laboratory, Manhattan Project, Nuclear, Nuclear Testing, Pueblos by Zoe. Bookmark the permalink.